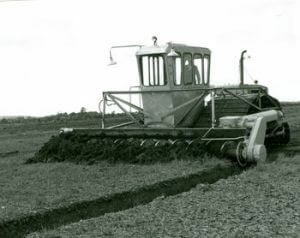 The purpose of his machine is to level and camber the fields at an early stage of development of a milled peat bog, to expedite surface drainage and to maintain the surface condition of milled peat production bogs. The tractor is a full track type with power and transmission units exactly as for the Type III harvesting machine excepting the final drive to the tracks which is by sprockets and chains. 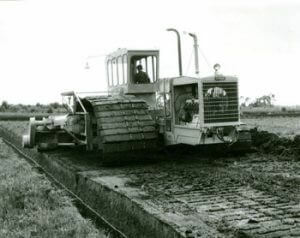 The tracks comprise the same components as the Type III harvesting machine but are of greater proportions to achieve the low bearing pressure required for operation on bog in the early development stages. The attachment comprises a sturdy cutting screw, supported at each end from its back plate and driven at the non-discharge end by a bevel gearbox located on the back plate and final chain drive. The drive is protected by a tension bolt safety device on the final sprocket. The attachment is carried on the tractor unit at the rear, on hydraulic rams, and its position relative to the machine is governed by radius arms and central thrust rollers, fixed to the screw back plate, and free to travel vertically in a guide attached to the tractor unit. The camber and depth of cut is readily controlled by the hydraulic system control valves located in the driver’s cab. Some of these machines have been converted by replacing the boom, described above, with a screw levelling attachment. The drive to the screw is by roller chains and sprockets and bevel reduction gearbox. The screw, of sturdy construction, is made up of fabricated steel flights on tubular steel core. The screw is supported at each end from the back-sheeting, with generous space between the discharge end of the flights and the support at that end to allow passage of spoil. The control of the attachment achieved by the existing hydraulic rams in the vertical plane while the attachment is fixed to the machine frame by radius rods which allow tilting of the attachment. A tension bolt safety device is incorporated in the final drive sprocket to protect transmission damage due to overload. The top layer of the bog was of a poorer quality at times. A stripping machine was used to remove this.